The historic old town of Hamelin with its beautiful Renaissance buildings is just a short walk away. The 4-star Mercure Hotel Hameln is centrally located by the Bürgergarten and has 105 comfortable rooms with free WIFI as well as leisure facilities including a swimming pool, sauna and steam room. A versatile conference area is available for your events. The hotel is 0.9 miles (1.5 km) from the train station and 40.4 miles (65 km) from Hanover Airport. If traveling by car, take the A2 highway. The small town of Hamelin in the Weserbergland, south-west of Hanover, resembles a historical townscape with many timber-framed and stone houses. The old town of Hamelin boasts numerous masterpieces from the Weser Renaissance. 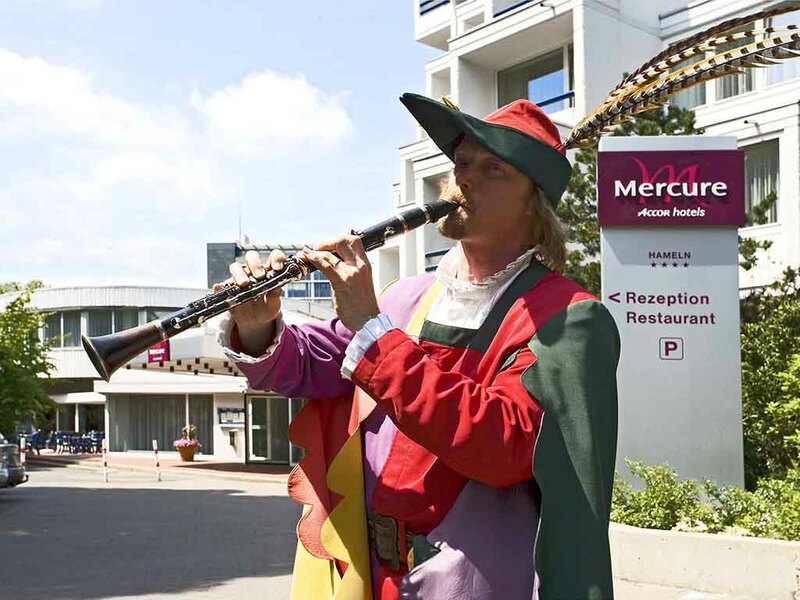 At the 4-star Mercure Hotel Hameln, you have the choice between Standard Rooms with a single or queen-sized bed, Superior Rooms with a double bed and Privilege Rooms (Family Rooms) with a double bed and in some cases a sofa bed. All 105 rooms in our hotel feature WIFI. One child aged up to 12 years can sleep free of charge in your family room. Your pet is welcome at no extra cost. Visit the "Safran" restaurant for top-class international specialties served from 6.30am until 10pm every day. Enjoy our chef's creations and let his culinary skills astound you.